A graveyard for the poor of the parish of St James’ parish was established on Lyncombe Hill above the site of the parish’s Poor House and adjacent to Southcot House. It was for both Abbey and St James’s parishes. Location of the Graveyard from the Cotterell map of 1852. (The Abbey & St James’ Poor House which opened in 1781 is located in Widcombe. It did not serve Widcombe parish which had its own Poor House.) According to an advertisement headed ‘New House of Industry’ which appeared in the Bath Chronicle of 10, 17 and 24 Oct 1782 there were then 70 paupers in the house and the guardians had yet to be appointed. There were between 50 and 100 burials a year, with a peak in 1837. 62% of burials were for St James and 22% for Abbey parish. 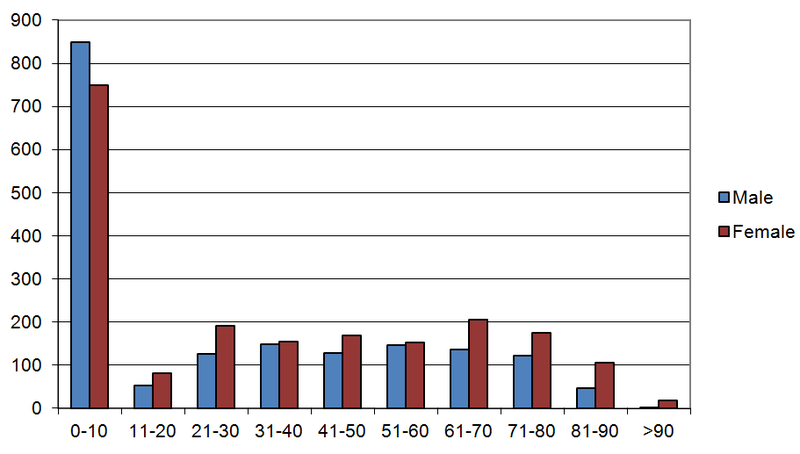 The number of burials per year has a peak of 254 in 1837. The cause of this seems to be an influenza epidemic. A press report of a visit of the Bishop in the Bath Chronicle of 26 Jan 1837 refers to “the prevailing epidemic had caused the audience to have been less numerous than could have been wished”. A press report on 27 Apr 1837 refers to the consequence of “the grievous epidemic which has recently subsided” on attendance at the Theatre Royal. At the Workhouse, the monthly rate of burials did not reduce from its elevated level, with peaks of 34 in both May and July, until May-Oct 1838 when it was between 5 and 10. The peaks in mortality evident at Twerton in 1832 and 1849 due to cholera are not as evident at the poor house. The cemetery closed in the 1857 and it was about this time that St James’ then had its poor buried in Widcombe’s cemetery at St Mark’s. The land was subsequently built upon and is the location of Forefield Villa, 37a Lyncombe Hill. The cause of death is given for entries from July 1805 to November 1806. Thereafter there are only occasional references, limited to where smallpox was the cause. For this limited time-period, the major categories were: smallpox 33%, decline 21% and fits or convulsions 13%. Only 2 out of the 126 entries (1.6%) had consumption as the cause but the true rate may be hidden by the use of ‘decline’ to categorise the cause of a fifth of the deaths. The Bath Union Workhouse opened in 1838 and its burial ground in 1847. In the period 1838-1847 the bodies of those who died at this new workhouse were returned to their parishes for burial. In the period 1847-1900 the burials were in the workhouse's burial grounds and from 1900 the returning of the bodies to the relevant parishes resumed. The burials in Abbey & St James' Workouse's burial ground in the period 1847-1857 were for the poor who were not confined to the Union Workhouse. From 1861, burials for the parish of St James were in the Lyncombe & Widcombe and St James' cemetery. 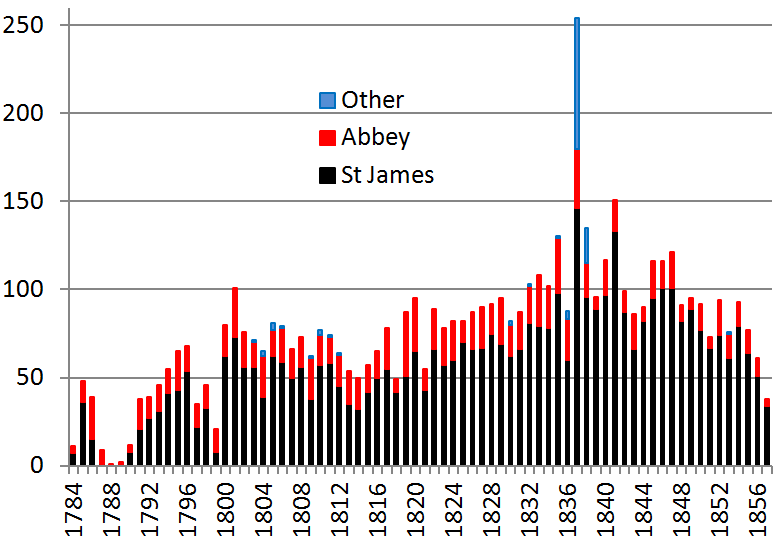 Abbey & St James (Poor), Bath - Burial Register Index, Widcombe Association (2013). Copy at Bath Record Office.